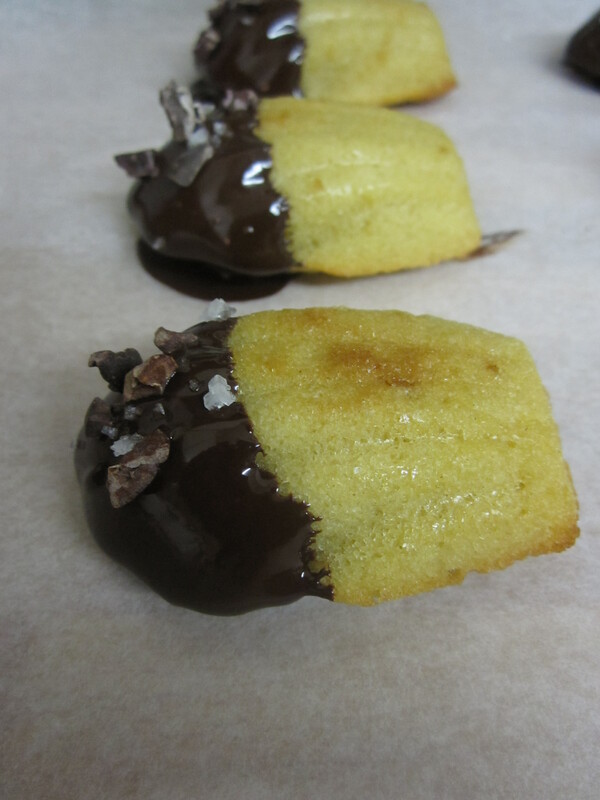 These delightful little shell Madeleines are great for a bake sale or even an afternoon tea. I’ve taken the basic recipe to the next level by dipping them in a rich bitter dark chocolate and with a sprinkle of crunchy earthy cocoa nibs and a crisp salt flakes. And with a 8 minute bake they can be eaten that much quicker!! With the shell shape and the sea salt they will be perfect for a trip to the seaside before the weather turns cold! Place the flour in the bowl and sift in the baking powder and the salt. Whisk together with the coconut, set aside. In a small pan gently melt the butter, brown sugar and honey over a medium heat to dissolve the sugar for about 1 minute. And set aside. 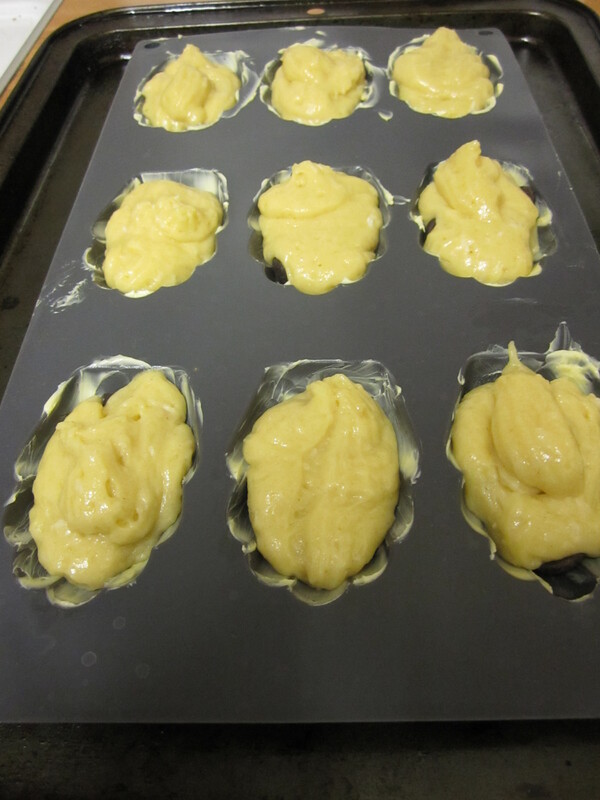 Preheat the oven to 175C, brush the madeleine moulds with butter and chill in the fridge to harden the butter. I used a good silicone mould that I placed on a baking tray. Transfer the mixture to a piping bag, piping approx. 20g batter into each mould hole. Tap the bottom of the pan against the counter top to smooth the top of the batter. Bake for 7 to 8 mins until the tops are lightly browned and a skewer comes out clean. 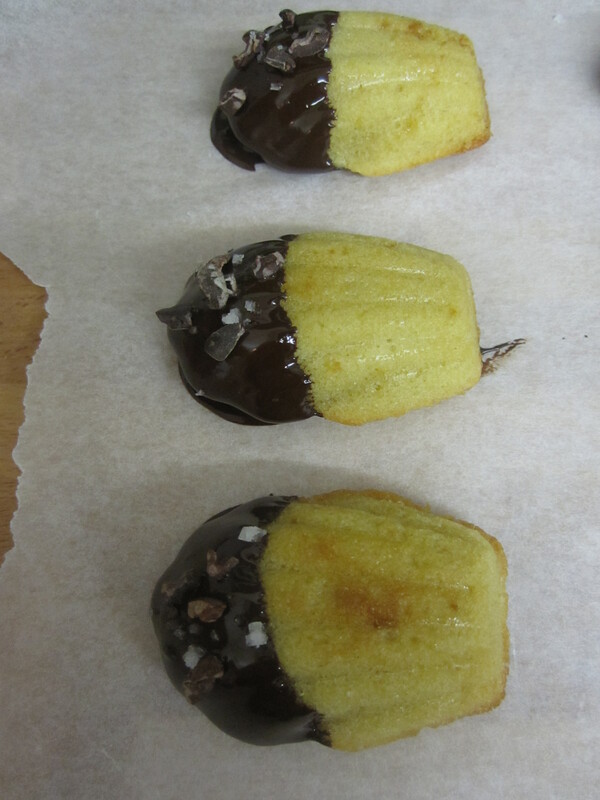 Immediately unmould the madeleines and leave to cool. Dip into the melted chocolate and sprinkle with the cocoa nibs and sea salt before it sets. Place on parchment paper and leave to set at room temperature. They are best on the day they are bake but can be stored for up to 1 day – if they last that long! These sound amazing! I just bought a madeleine tray and sea salt was one of the first flavours I wanted to do to compliment their shell shape. Love it! You should give them a go! Super easy to actually make the batter just lots of weighing!